The rough layered buttercream effect on this cake was created by hand. 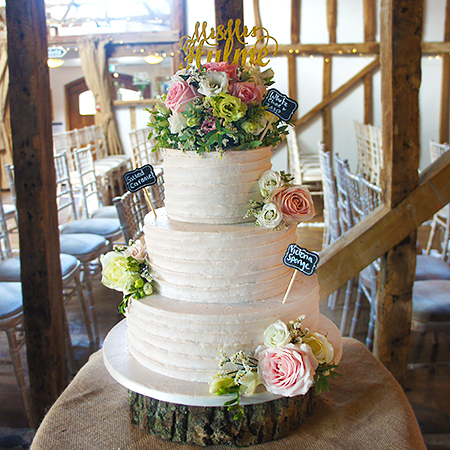 Decorated with fresh flowers supplied by Miss Mollies Flowers in Basingstoke and topped with a personalised cake topper this cake looked beautiful in the lovely rustic barn setting of Pitt Hall Farm. Toffee sponge with salted caramel buttercream, Victoria sponge with vanilla buttercream and jam and a white chocolate sponge with raspberry buttercream a selection of different sponges to alight your taste buds.